How long is teething process last? 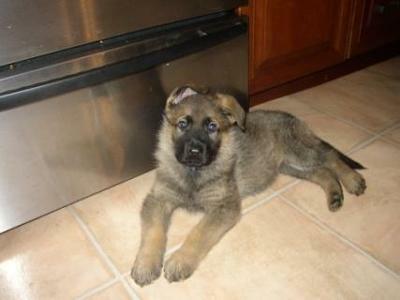 We have a 3 month German Shepherd that we got from the New Skete Monastery. He is teething like crazy and we wondered how long was the teething process from start to finish. Although it can vary a bit from dog to dog you can typically expect the teething process to last from the ages of 4 to 7 months, or thereabouts. So, your German Shepherd puppy is probably just starting out in teething - and it will last for a few more months so get yourself a whole lot of puppy chew toys to keep your puppy busy. The best thing I can suggest is to keep a supply of puppy chew toys and to rotate them over time so that they don't have the same toy the whole process. This way, they will be more interested because they have a never ending supply of "new" toys and the toys will last longer because they don't get chewed to pieces quite so fast.